Kurumayama kogen Ski Resort (車山高原スキー場) is a great winter sports spot with beautiful snow located in Nagano Prefecture. Because its altitude is very high, 1,500m to 1900m from the sea level, the quality of the snow is very great. There are 8 different courses from the beginners to experts. Especially, the beginners courses has long and wide space so that people can practice well. From the top of the mountain, it has a great view of Mt. Yatsugatake, Minami Alps and Kita Alps. 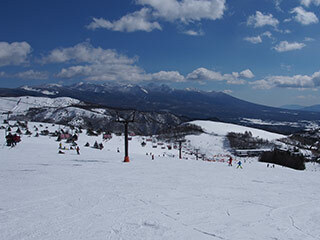 One day Lift Ticket: 4,000 yen for adult, 2,500 yen for kids. Period: the early of December to the end of March. 1. use Chuo Line to Chino Station. Kurumayama Highland Ski Resort is one of the wide open ski resorts located around lake Shirakaba in Nagano Prefecture. The rate of the sunny day is very high, and it has a great view of Nadano mountains. It has 8 different courses that covers from the beginners to the expert. Also, there is kids park. There are restaurants, gift shop and rental ski & snowboad. Family: 140m high and 900m long. Panorama: 350m high and 2,000m long. Srarom: 130m high and 600m long. Toribian: 130m high and 650m long. Venus: 280m high and 1,000m long. Sports man: 200m high and 750m long. Chaptain: 200m high and 750m long.